It can always be tricky trying to get the whole family in the same place at the same time, but somehow we all manage to pull it off. It’s a day full of eating, opening presents, listening to Christmas music and of course drinking Two Chimps Coffee! “Santa’s been, Santa’s been!” The day starts off at around 5 in the morning when your kids burst through the door, begging you to get up and come downstairs to open the presents. This seems like a pretty good time to have a coffee. I’d recommend ‘Captain Caffeination’ or ‘Ready, Set, Bananas!’ to get your early Christmas morning started. You’re definitely going to need that extra kick! So, after your early rise and the presents being opened within a matter of minutes, it’s probably around this time that it dawns on you that the rest of your family will start to arrive soon. Coffee time! I’d recommend either ‘Box Of Frogs’ or ‘How Many Is A Brazilian?’ Hopefully one of these coffees will calm your nerves of trying to fit eight people around a table that only sits four. As your family start to arrive, it’s time for more present opening! Ahh, your family know you too well. They’ve got you a brand new coffee maker! 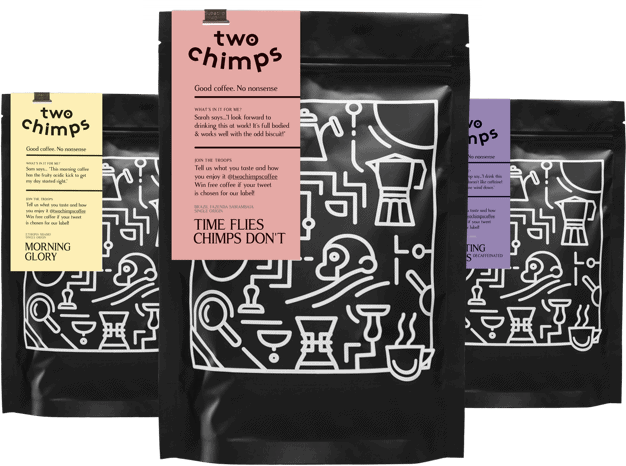 This seems like a great opportunity to offer everyone a cup of Two Chimps Coffee. Why not add someTurkish drinking spice to your coffee? It is Christmas after all! Ahhh, you’ve gotten to that time of day where you’ve just eaten your body weight in mince pies, and you’re sat in front of the TV watching the EastEnders Christmas Special. This is the time to enjoy a nice evening coffee as you say goodbye to Christmas for another year. I would recommend either ‘The Cat’s Pyjamas’ or our decaf ‘Starry Eyed’. I know what you’re thinking. “With all these coffees I’m going to be making I’ll run out!” Not if you have a coffee subscription. With our coffee subscriptions, you can choose which coffee you would like, how much you want, the grind size and when you would like it to be delivered. If you’re looking at our coffees and you can’t decide on one, choose our mystery subscription. Each time your delivery arrives, it will be a different coffee! This way you will be able to try all our coffees. It can’t get better than that. Our coffee gift subscription will make great Christmas presents for any coffee lover too. Or, if you are looking for the ideal Christmas Present for the coffee lover in your life, head over to our equipment and gift shop now.